Jewelry Cleaning and much more. With proper care and maintenance, your fine jewelry will reward you with a lifetime of enjoyment and luxury. Vartani Jewelers offers a full range of professional jewelry repair, refinishing and refurbishment services that make it easy for you to recapture the pleasure your jewelry was meant to bring. Have a favorite ring that doesn’t fit any more? Our expert jewelers can determine your proper ring size and professionally size your silver, gold or platinum ring to fit you perfectly. Ring re-sizing services are available for all ring sizes. Is your diamond loose in its setting? Proper maintenance and prong retipping can prevent you from losing your precious diamonds. 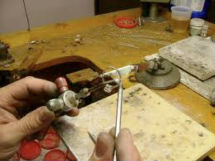 We can inspect your jewelry mountings and prongs for wear while you watch our jewelers service your jewelry. Missing gemstones from your jewelry? Our professional jewelers can replace the stones in any setting — solitaires, three-stone rings, tensions settings, channel settings, bezel settings or pavé. Or we can set loose gemstones in your chosen mounting. Want to re-use your old jewelry to create a new custom-design? We’ll create a beautiful new piece of custom jewelry you’ll cherish forever using a variety of techniques from lost wax casting to hand fabrication to deliver the unique jewelry design you desire. Are you properly cleaning your jewelry? We can clean, polish and restore your jewelry to look like new! 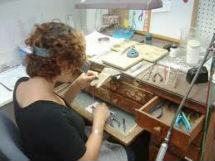 Our professional jewelers will make your jewelry sparkle right before your eyes. And recommend the proper cleaning products for your specific jewelry. Want to know what the value of your jewelry is ? All appraisals of diamonds, watches, gemstones and other jewelry done while you watch. Stop by today . Our appraisals are accepted my most insurance companys. Make an appointment today.